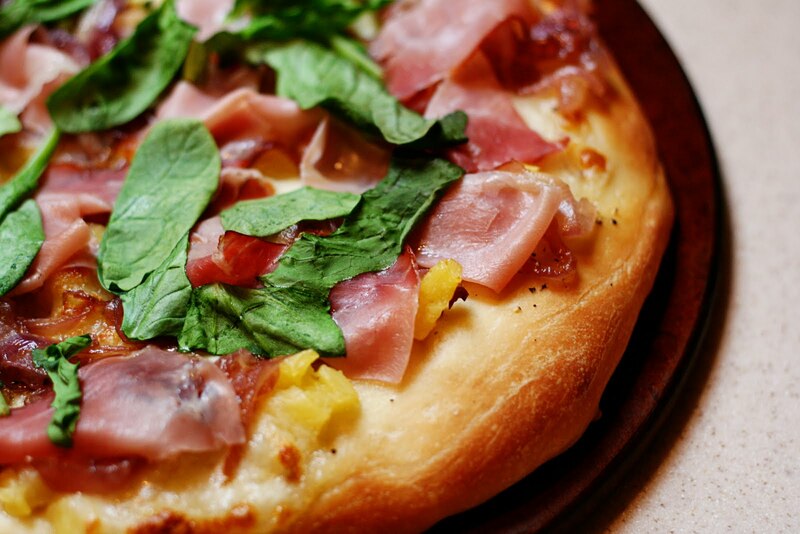 It's a fancy schmancy version of a Hawaiian Pizza! I could have eaten this entire pizza by myself -- it was that good. I am a regular follower of A Cozy Kitchen blog. One day last week there was a post about this yummy version of the Hawaiian Pizza they like to order from Domino's. The girls had been asking to have pizza for dinner so I figured we'd try this one out. I made a regular cheese version for them and this one for the grown-ups. After they saw me putting the pineapple on this one they decided they wanted it, too. Needless to say, there weren't any leftovers! I used a prepared pizza crust from Trader Joes, but most grocery stores sell them in the deli section for around a dollar! They are SO much better than the pre-baked ones! If you are particularly interested in making your own crust, then the link below will provide a recipe. There are just times when you need convenience, right? I also substituted spinach for the arugula that is listed in the original recipe. I just like spinach better. In a medium pan add a tablespoon of olive oil and sliced onions. At the five minute mark, add a 1/4 teaspoon of salt and keep cooking until completely caramelized. If they dry out, simply add a little water one tablespoon at a time. Should take about 20-30 minutes to completely caramelize. Gently pull pizza dough apart into a circle Place on the pizza stone. Drizzle with 1/2 teaspoon of olive oil and sprinkle with salt and pepper. Add mozzarella and diced pineapple and place on the stone in the oven. Bake for 10-15 minutes, or until cheese is melted and crust is golden brown. Remove from oven and add the prosciutto, warm caramelized onions and arugula.